Earlier this year I photographed Janet and Kevin’s wedding in Laguna Beach. In attendance was Becky Prelitz- a local artist. After viewing their images, Becky contacted me to document her artistic process- and it was mind-blowing. 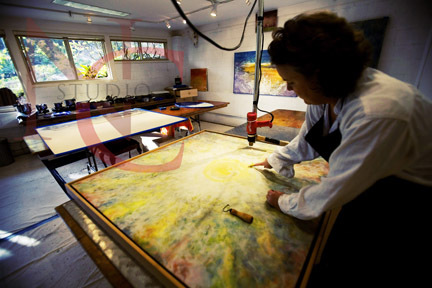 These are images of her studio and the artist at work. The large art piece was commissioned by Janet and Kevin, they wanted it to capture their wedding day. To commission a piece of art www.prelitzart.com Becky will also have a booth at this years Sawdust Festival in Laguna Beach. This is a shot of the sky and view from the ceremony location. ← It’s Wednesday night… no more LOST!